Don was born in Floydada, Texas, on May 28, 1917. He grew up in Canyon, Texas, and in 1937 received his B.S. from what is now West Texas A & M University. The Panhandle region of Texas includes many deposits preserving rich assemblages of vertebrate, particularly mammalian, fossils. In the late 1930s, C. Stuart Johnson, a student at the University of Oklahoma, was deeply involved in studies of many of these sites. Don helped with this research and later reflected that Johnston’s enthusiasm for vertebrate paleontology stimulated him to specialize in the field. From Texas, Savage went on to graduate work with J. Willis Stovall at the University of Oklahoma and earned his M.S. in 1939. World War II interrupted his academic career, and he spent six years in the U.S. Air Force, where he became an expert in photoreconnaissance and mapping. In 1946 Don came to the University of California, Berkeley, as a graduate student to study with R.A. Stirton. He worked in the Museum preparation laboratory on Stirton’s Colombian fossils and enjoyed a variety of field work. On one interesting trip to Washington with Professor J. Wyatt Durham, he prepared a cast in situ from the natural mold of an extinct rhinoceros that had been trapped in an ancient lava flow. His dissertation research involved a comprehensive analysis of the mammalian faunas that lived in the Bay Area during the Pleistocene, the last 2 million years or so. In his research he paid particular attention to the geological settings of the fossil localities. His interests in the geology and fossil record of the Bay Area would continue throughout his career and resulted in a variety of geological mapping projects and paleontological studies that greatly increased our knowledge of this and other parts of California. 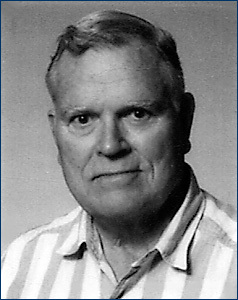 Don obtained his Ph.D. in 1949 and joined the faculty of the Department of Paleontology and the staff of the University of California Museum of Paleontology. His students remember him as a dedicated, caring, and effective teacher. In the classroom his lectures stimulated their interests in mammalian evolution. Particularly memorable are the many class field trips that on weekends or university holidays not only introduced students to significant fossil localities in western North America but also resulted in collections that became the bases for student research projects. Don and his family opened their home to generations of students as well as many visiting scientists and helped build the museum’s academic community. Many of his graduate students also remember him as a remarkably skillful and rarely defeated player on the handball court. Throughout his career, Don played an active role in the Department of Paleontology, serving as its chair from 1966 to 1975. He was named Director of the Museum of Paleontology following the death of Stirton in 1966 and served through 1971. During the 1960-61 academic year, he participated in the complex task of moving the department and museum from the upper floor and attics of the Hearst Mining Building to new quarters in McCone Hall. He prepared a history of the Museum, illustrated with many photographs, for public dissemination (previous Museum reports had been directed solely to the President of the University). Don saw to the casting of the skeleton of Palaeoparadoxia, an extinct sirenian discovered in 1964 during construction of the Stanford Linear Accelerator. He was a leader in the development of the first computer-based catalogs of the museum’s collections and its archive of associated geographical and geological data. Working with museum scientist Barbara Waters, he adapted casting techniques to safely duplicate minute, delicate vertebrate fossils and applied these techniques on trips to many North American, European, and Asian museums. The resulting assemblage of casts greatly expanded the scope of the museum’s collections and continues to serve as a valuable resource in teaching and research programs. Beyond the Berkeley campus Don contributed to the development of the Society of Vertebrate Paleontology (SVP) and served as its president in 1971-72. In 1989 he was elected an honorary member of the SVP, a prestigious award that recognized both his contributions to the society and his significant accomplishments in research. Don retired from the faculty and museum staff in 1988 but continued to be active in research, and in 1995 he helped to design the new exhibit halls at the Oklahoma Museum of Natural History. One of the major themes of Don’s research is reflected in his contributions to stratigraphy. Much of this research was based on fossils that he had helped to collect, paying particular attention to the levels in the local sequence of rock units at which they were found. He was a major contributor in refining interpretations of the evolutionary history of mammals and the sequence of their occurrences in the rock record that contributed to development of the geological time scale that is used today. In the late 1950s and early 1960s, John Reynolds (Department of Physics) and Garniss Curtis and Jack Evernden (Department of Geology and Geophysics) developed the potassium-argon age determination method that could be applied to volcanic rocks. In a landmark paper (American Journal of Science 262:145-198, 1964), Evernden, Curtis, G.T. James (Department of Paleontology) and Savage reported on the first series of age determinations of volcanic rocks closely associated with mammalian faunas. This work stimulated many similar studies in North America and abroad. Over the years these have led to increased refinement of our understanding of the tempo of evolution of mammals and other organisms. Don was the first to utilize screening and washing techniques, previously used only with Pleistocene sediments, for the collection of small vertebrate fossils — tiny teeth of fish, reptiles, and mammals — from Late Cretaceous and early Cenozoic deposits of the Great Plains and Rocky Mountains. This method led to a significant increase in our knowledge of the diversity of continental faunas of these ages — knowledge disseminated through the published works of Don’s students. Don also had a keen interest in biogeography, particularly the patterns of intercontinental dispersal of terrestrial vertebrates. In 1944 R.A. Stirton had begun fieldwork in Colombia that received support from the John Simon Guggenheim Foundation and the University of California Associates in Tropical Biology. During the summer of 1950, as part of this continuing project, Don undertook the first of what would become a series of international expeditions. Accompanied by O.P. Pearson (who later joined the Berkeley faculty and played a major role in the development of the Museum of Vertebrate Zoology) and Colombian colleagues, the field party collected in the Tatacoa Desert of Colombia. They returned to Berkeley with extraordinarily well preserved skulls of crocodilians and excellent material of ground sloths and other endemic South American mammals. Analysis of this and earlier collections began to highlight striking biogeographic differences between Tertiary faunas of Colombia and Patagonia. Just over a decade later, in 1961, Don joined a former student, D.E. Russell, in France and, with French colleagues, began a long-term study of European Eocene faunas. Applying his screening and washing techniques to well-known fossil localities yielded remarkable results. A series of publications based largely on these new acquisitions greatly expanded knowledge of the Eocene faunas of France and helped highlight the extensive interchange of mammals between Europe and North America that marked the beginning of the Eocene. In 1983 Savage and Russell published Mammalian Paleofaunas of the World, which became an influential reference work. Don also developed a deep interest in the early evolution of primates, particularly during the Eocene. His work in France contributed to documentation of an early evolutionary radiation of primates, as did a long-term collecting program in the Eocene deposits of southwestern Wyoming. In 1978 Don and Russell Ciochon, then a student in Berkeley’s Department of Anthropology, were the first paleontologists to return to a series of Eocene deposits in Burma that, in the 1930s, had yielded an early record of primates that might be very primitive anthropoids (a group including monkeys, apes, and humans). Their discoveries and subsequent work strongly suggest that southeastern Asia was part of the biogeographic region in which anthropoids originated. Donald E. Savage died of pancreatic cancer on April 5, 1999, at the age of 81. Used with permission of the Academic Senate of the University of California; supplemented with excerpts from Joseph T. Gregory’s article on Don Savage from UCMP News, September 1997.